The Old Stone Fort is a prehistoric Native American structure located in Coffee County, Tennessee. The structure was most likely built between 80 and 550 AD during the Middle Woodland period. It is the most complex hilltop enclosure found in the South and was likely used for ceremonial purposes rather than defense. The structure is now part of Old Stone Fort State Archaeological Park. 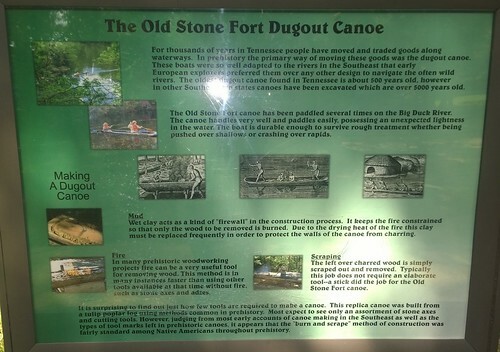 The Old Stone Fort is located on a peninsula created by the confluence of the Duck River and the Little Duck River (the section of the Duck River upstream from its confluence with the Little Duck is sometimes called "Barren Fork"). The Duck River forms the peninsula's northwestern boundary, the Little Duck forms the peninsula's southeastern boundary, and a westward bend in the Little Duck forms the peninsula's southern boundary. The walled area of the structure encompasses approximately 50 acres (200,000 m2). The walls of the Old Stone Fort consist of stone and earthwork, and are on average approximately 4–6 feet high. The walls originally consisted of an inner and outer layer of crudely stacked rocks and slabs with gravel and earthen fill in between. Over the centuries, the earthen fill has spilled over the rock layers, giving the walls their current mound-like appearance. The walls can be divided into roughly three sections, with two sections running roughly parallel to the Duck and Little Duck Rivers, and a third section running parallel to the southern rim of the peninsula. The sections paralleling the rivers gradually move inward, away from their respective rivers, and approach one another in a pincer-like formation at the northeastern half of the peninsula. Here, both walls terminate just before converging, allowing for a small entrance. Two ancient "pedestal" mounds— one 35 feet (11 m) in diameter and the other 48 feet (15 m) in diameter— are located on either side of the structure's entrance. The entrance continues through a 120-foot (37 m) L-shaped corridor which opens into the structure's interior.